I cannot tell you how many times some form of this phrase was repeated to me while I was struggling with pelvic pain. Doctors, surgeons, pelvic physical therapists… they all had an opinion about what was best for me. At the time, I wholeheartedly believed and trusted them! It was a struggle for me to sit through my college courses. I could not fathom sitting on a hard bike seat. You shouldn’t run on a treadmill. Too high impact. You shouldn’t do yoga after that surgery. Too much flexibility will hurt your hips. You shouldn’t squat heavy weight. Too much pressure on your pelvic floor. You shouldn’t sit on a bike. Too much compression of your pudendal nerve. The lists were endless and the fears instilled in my patients were rampant. I knew the best thing to do was to show them that they can. In the past 4 years I have run a marathon, climbed two 18,000+ peaks, and swear by my daily gym or running ritual. Yes, there are days you will find me resting too, but exercise has changed the course of my life. I need the mixture of high intensity cardio, strength training, and mobility work to keep my body powerful and symptom-free. I cannot lie to you and tell you I said an enthusiastic, "yes", when my boyfriend proposed the trip a few months ago. In fact, I remember telling him that it might be too much for my body and my pelvic muscles and that I might only be able to complete the first day. Over the past two years the two of us had accomplished so many physical feats that pushed our bodies to their limits. However, doubt and fear clouded my mind when he mentioned biking. How could I sit on a small seat for 15 hours the first day and then 12 hours the next? I had bought my first road bike this past year, but the longest I ever rode was 33 miles. It felt great (especially with an ice cream stop halfway), but it was nowhere near the mileage we were looking to do over Memorial Day weekend. I decided to give it my best shot. Since we were going from the high point of Ohio to the low point, we’d never be more than a 2 ½ hour drive from my boyfriend’s family, and I figured if things were bad they could always be my lifeline and pick me up. And so I woke up at 4:30am last Sunday morning, slid on my padded bike shorts, and took two hits of nasal spray (the cottonwood was terrible!) and got in the car to drive to Bellfontaine, Ohio. The sun was just beginning to rise as we unloaded our bikes at the very scenic highpoint located in the parking lot of a tech school. I had too much adrenaline to think about “what-ifs” and “should” or “should-nots.” I simply got on my bike and pedaled toward the horizon where a beautiful sunrise had started to wake up the surrounding farmland. "I simply got on my bike and pedaled toward the horizon where a beautiful sunrise had started to wake up the surrounding farmland." With a 6:00am start on Day 1, we had plenty of time to cover the 150 miles to the low point in Cincinnati along the Ohio river. We traveled at a moderate pace, around 16mph, and stopped every two hours or so for a reward (ice cream). Ohio is incredible as it has more paved bike paths than any state in the nation, and it goes right through adorable small towns. We had specialty coffee breaks, jumps in the river to cool off from the 90 degree heat, countless ice cream and cold Gatorade stops, brewery stops, and carb-loading stops. I kept track of every 10 miles that passed, surprised at how great I felt and how little I felt. Yes, I got overheated and hungry and somewhat delirious, but I never experienced the sharp pain I anticipated from sitting on my bike. We pedaled on towards Cincinnati and with every mile I gained back confidence in what my body could do. I didn’t need to be rescued or picked up, I was flying. 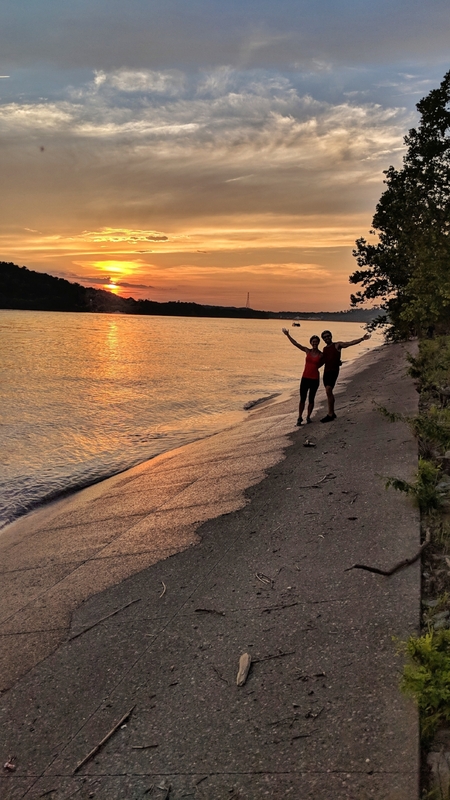 140 miles later we got to the banks of the Ohio river as the sun was setting. With no time for celebration, we snapped a few pictures and pedaled the 10 miles back up some hills toward our hotel. The Holiday Inn Express came into view like a green-lit beacon in the distance, but we rode right past it across the road to a Longhorn Steakhouse, 20 minutes before they closed, to consume copious carbs, steak, and margaritas. We finally dragged our bikes and bodies to the hotel room, showered the 150 miles of dust off, and passed out. "Fear was rooted deep in my mind, along with the belief that maybe I wouldn’t be able to make it home. I recalled how many people told me what I shouldn’t do, and with a deep breath I hopped back on the saddle, and did the only thing I could do. I started pedaling." The next morning I kept my eyes closed an extra second when I woke up, not wanting to feel anything when I got out of bed. I was still scared of what could happen! Fear was rooted deep in my mind, along with the belief that maybe I wouldn’t be able to make it home. I recalled how many people told me what I shouldn’t do, and with a deep breath I hopped back on the saddle, and did the only thing I could do. I started pedaling. The first 5 miles of the morning were not pleasant. I was sore, and it was sensitive to sit on the seat. I rode next to my boyfriend and asked how he felt. He was in incredible shape and had no significant past medical history or bouts with pelvic or chronic pain, so he was a good baseline. Turns out he felt the same way! Turns out if you ride 150 miles, your pelvic muscles are going to be slightly sore whether you had pelvic pain or not! With a grin, I pedaled ahead, taking time to stand up and stretch, and ease my body into the morning. After those first 5 miles, I felt no pain. 60 miles into the second day, I heard a voice behind me say abruptly, “on your left!” We had fallen into a trance on the bike path, not seeing a single person for many miles. In less than two seconds, my boyfriend stopped pedaling, thinking I had said something, my front tire touched his back tire, and I fell to the pavement going 15mph. As I opened my eyes, I knew nothing was seriously wrong, but felt my right leg and arm on fire and knew there would be bruises and blood. In less than a half a second, my arm had come up across my face, protecting my head from any harm. It’s incredible how your body can protect you in an instant. Two worried faces peered down at me as I turned over and sat up. I assured them everything was okay. Sure enough, there was a decent amount of blood, but the cuts didn’t go too deep. I washed my leg with water, picked out the gravel, and got back on my bike. The first 10 miles were in no way pleasant. In fact, they felt like someone splashed my leg with peroxide every time I turned the pedal. But I didn’t want to give up. For one thing, I was having too good of a time and didn’t want to be picked up. I also finally felt like my body could do anything. By getting back on my bike, I told my nervous system I wasn’t in danger and did not need to be alarmed. I had no limitations. No "shouldn’ts" or "couldn’ts". No more fear! It helped that we stumbled across an 1850’s brewery in Dayton less than an hour later and stopped in for early dinner and libations. Spirits much higher, we climbed back on our bikes, and began the last three hour trek towards home. When we were only an hour away, my legs became cement and my speed slowed. I just kept the pace as best I could, and told myself I would turn it on when I was 15 miles away. Incredibly, the body has a magic reserve during endurance challenges, and with new vigor and life in my legs, I started pedaling furiously towards the setting sun and home. 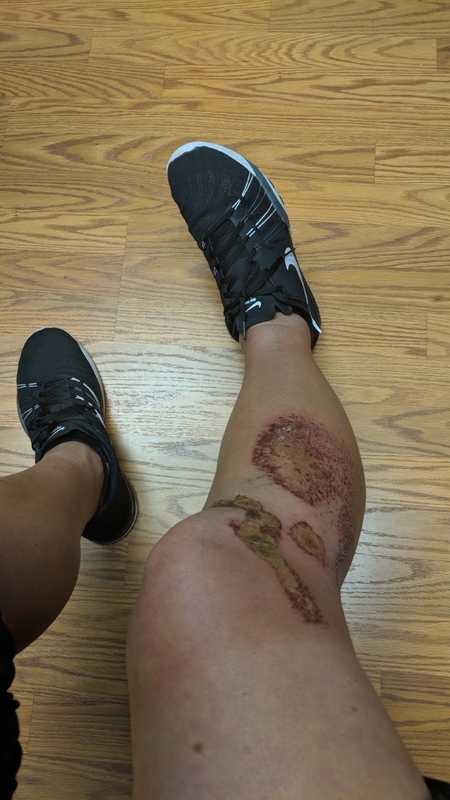 The wind rushed past the dried blood on my leg and cooled the sweat on my face as I kept pumping harder and harder, squeezing out every last bit of energy in my legs. As the final hill came into view before the cabin, I smiled again. I proved everyone wrong, even myself. And getting back on the bike is better than not trying at all. And getting back on the bike is better than not trying at all."